We spent the first night of our grand Northwest tour in Vernal, Utah. Now, on night 28 we’ve come full circle and spend our last night on the road in Vernal, Utah – a journey of over 5,000 miles. Tomorrow we’ll complete the final leg back home and our own bed-e-bye. With limited highways across this area we broke our goal of limited Interstate driving, taking I-80 and I-15 from Elko to Orem, Utah. I know that previously when I’ve driven this road I’ve said, “It’s so boring”. Today I appreciate the diverse geography, cloud formations and geology. Once across the Utah state line the topography flattens and we experience the mirage effect of light, shadow and reflection. Is that a lake ahead or a glistening dry salt flat. Our route crosses the California National Historic Trail several time. We discuss what it would have been like to be walking alongside a covered wagon day after day, month after month. They dreamed of new opportunities, were determined, dedicated and probably at times delusional. Today signs along the roadside warn of driver fatigue, encouraging stops at rest stops. 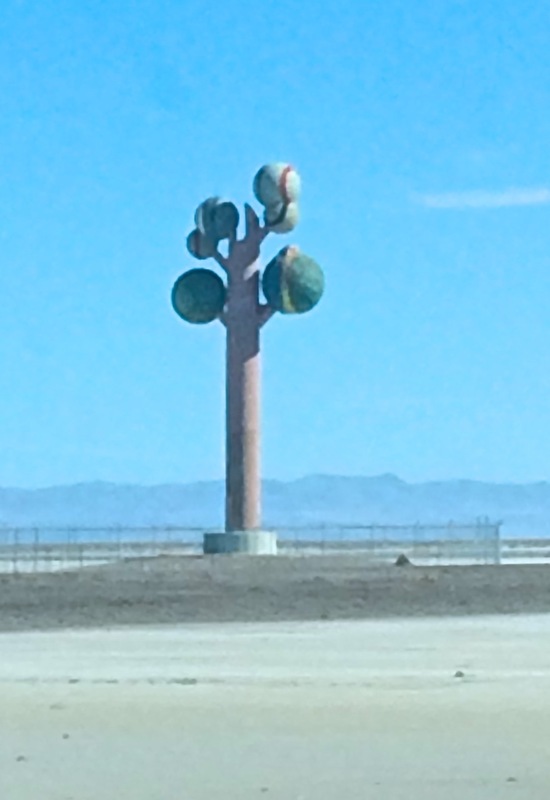 A sculpture along the north side of the highway breaks the flat horizon and elicits comments. Although we’re simple trying to cover mileage today we make a slight deviation from a direct route heading south to Orem to access Provo Canyon. We’ll connect to US 40 in Heber City. 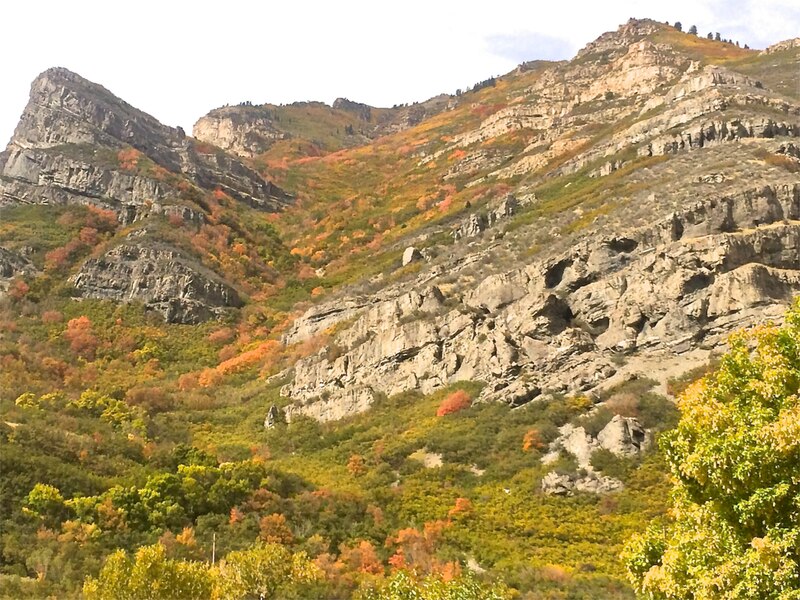 Mountain foliage in every color and shade associated with autumn covers the slopes making the scenic drive even more spectacular. 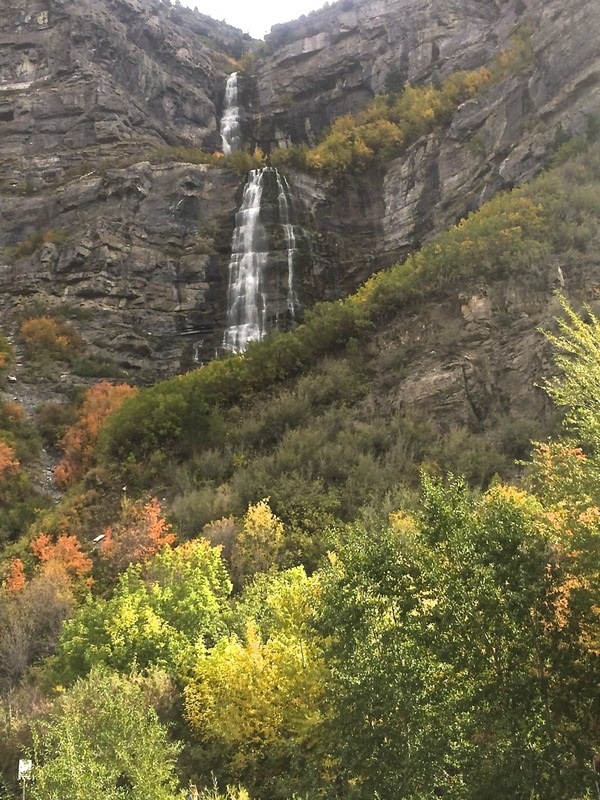 Numerous parks and viewpoints present opportunities to stop, stretch and admire the canyon or take a short walk to the base of Bridal Veil Falls. The thin light line bisecting the valley floor and reaching towards New Pass Summit is US Highway 50, labeled the Loneliest Road in America. The route spans from the shores of Lake Tahoe across central Nevada to Ely and the Utah state line. Heavy commercial traffic traverses the state on I-80 further to the north. 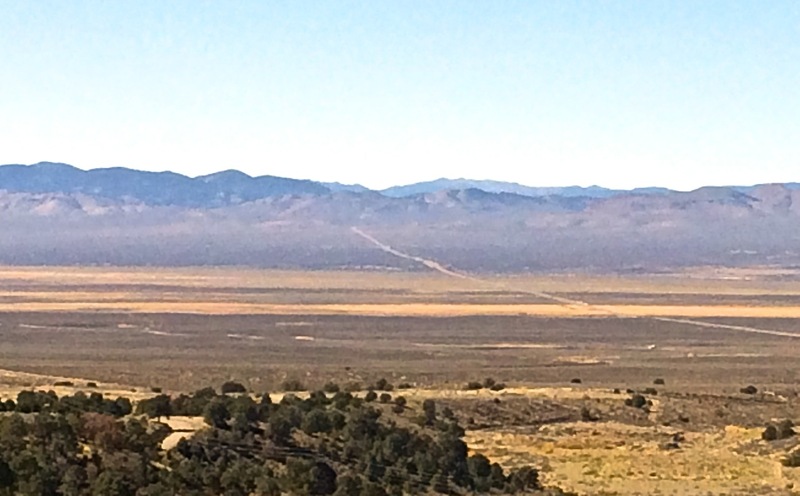 A series of towns and settlements line the first 60 miles from Carson City to Fallon. Then the traveler begins to understand the lonely label. Services, habitation and bathrooms are few and far between. I’m sure I wasn’t the first traveler to be desperate at the first mini-market in Austin. 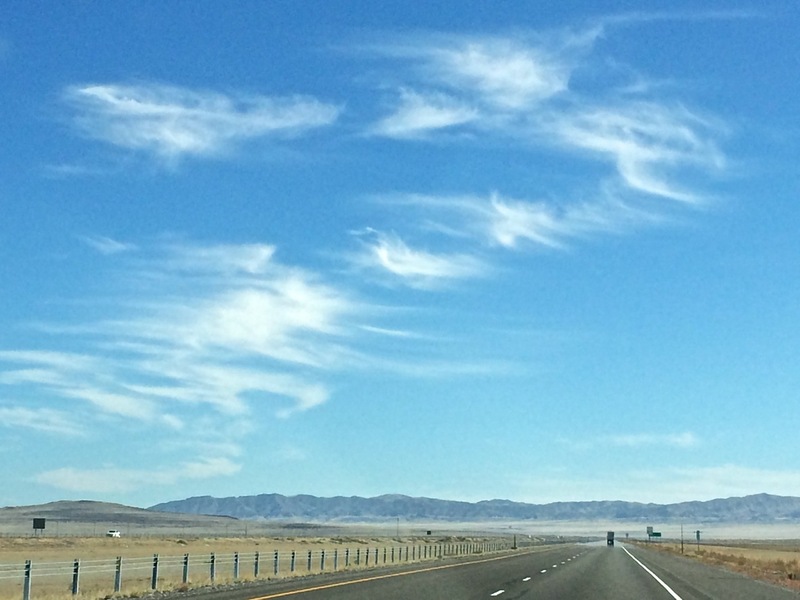 Since our lodging reservations were in Elko on I-80 we left the Loneliest Road and headed north on State Route 305 – even lonelier. We saw not a single car the first ten miles so decided to wager how many we would see on the entire 86-mile length. Bob said 10, I estimated 12. The total was 22 (plus I passed 2 vehicles). Most of the traffic was the last 15 miles near Battle Mountain because of active mining operations. 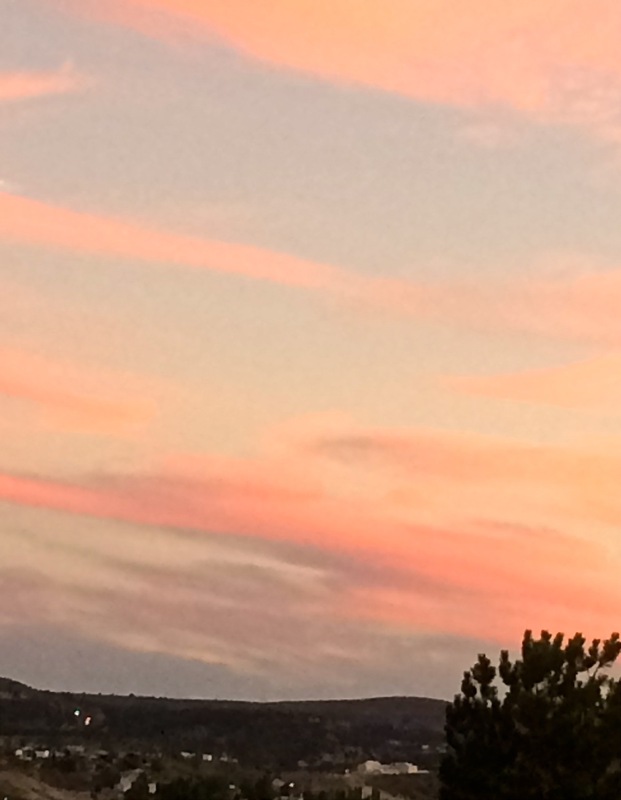 As we left our hotel to go to dinner we caught the shades of sunset in the wispy clouds. A not so lonely end to the day.